Emendo Bioscience edits the English in research documents. We correct the spelling, grammar and punctuation and improve the style so the science is as clear, logical and accurate as possible. If you want to improve the quality of your next publication, you can send your document now for a no-obligations quote. Emendo Bioscience specialises in helping researchers prepare manuscripts for publication in the most prestigious life science journals. We also edit covering letters, web sites, abstracts, posters, CVs, book chapters, letters, grant applications and presentations. Prices start from 60 EUR for 1000 words of original text. We’ll provide a precise quote including an estimate of turnaround time when we receive your document. You can find out more about how Emendo Bioscience can boost your research output by reading some of our success stories. If you have a project ready, please contact us now for more information. You can read the FAQs below to find out more about how our service works or learn more about us. Francophone customers may read a summary of the website in French. on the challenges of communicating bioscience. Bioscience editing, writing and advice. forays into French, and science on the radio. A lecturer asked us to edit a paper, his first as senior author, before submitting it to FEBS Letters. The paper was accepted by the journal after minor changes and published within 2 months of submission. This was perfect timing as he was just about to leave for 18 months’ sabbatical leave in California. A Chinese post-doctoral researcher with a granted patent in genome technology asked us to edit an application for a UK biotechnology start-up award. It was important to present the science accurately to non-specialists. The application was successful and the funding allowed the researcher to rapidly start up a company, hire staff, move into a bioincubator and develop and market a Crohn’s disease marker. A key paper in stress biology paper had been provisionally accepted on its scientific merit pending thorough rewriting. However successive revisions by the French and German authors only made the manuscript more incomprehensible. As the 3-month time limit for revision was running out, one author took advantage of the 10% editing discount for SFBV members. In the last 48 hours we revised the paper and it was resubmitted and accepted 2 weeks later by The Plant Journal. A professor from a Paris university submitted a manuscript edited by Emendo Bioscience to Plant Physiology on Christmas Eve. The paper was accepted with only minor changes required in the first week of the New Year. A researcher from CEA France submitted breakthrough research to Nature but unfortunately the manuscript was not accepted; only a small percentage are. However the science did catch the eye of another NPG journal editor. After review and revision, the paper was published in Nature Genetics, which as a monthly journal had an even higher impact factor than Nature. A PhD student asked us to revise the English in a paper, a condition set by the reviewers before accepting it for publication. The situation was all the more urgent as the publication was a requirement for her thesis defence. As soon as we had edited the manuscript, the student submitted the paper to Matrix Biology and it was accepted by the editor the same day. A CEA researcher asked us to edit a paper on bacterial genetics. The science was very well received by Journal of Bacteriology. After she had made the scientific revisions requested by the editor and reviewers, she asked us to recheck the manuscript, which we did for free. The e-pub version of the paper was published on line just over 3 months after the initial submission. The first author of a paper on the function of the intestinal epithelium asked us to rewrite a manuscript, a condition of it being accepted by PlosOne. The revised version was published online just one week later. How should I send my manuscript? Send us any text parts of the manuscript as Microsoft Word files in either .doc or .docx formats. Simply send the files as an attachment in an e-mail to info@emendo.co.uk. When should I send my manuscript? You can send us a manuscript at any stage of the writing/publishing process. Most authors choose to send us a manuscript before submitting to a journal. However you can also send us a manuscript, for example, before getting comments from co-authors or to improve it if it has already been rejected by a journal. Should I send the figures? It is up to you whether you send us figures or tables. If you would like us to edit legends it is better to send the corresponding figures or tables. We will comment if there are any problems with the English used in figures, for example, in axis labels, but generally we cannot edit figures directly. We can edit the English text in tables but please note this may disrupt the formatting. 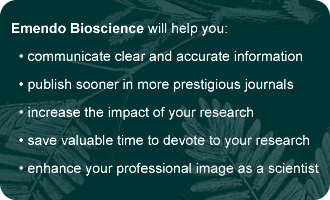 Do I need to tell you what journal I’m targeting? Will you format the manuscript for my chosen journal? It is very helpful for us to know what journal you are targeting mainly for checking that the structure, nomenclature and style is consistent with the Instructions for Authors. It is very important if we need to respect any word or character count limits for abstracts or titles, for example. However generally this information is not essential for language editing and we do not systematically format text for specific journals. Do you check the references? We do not systematically cross-check references between the text, the reference list and reference databases. However if we notice any obvious errors or omissions we will correct them or comment. If you would like us to cross-check references we can quote for this separately. How long does it take to edit a manuscript? For most average-length manuscripts our turnaround time is 1 week after you confirm the quote. However this may be shorter or longer according to the manuscript and demand. We will always give an estimate of the completion date and keep you posted on progress. How much will it cost to edit a paper? We use the Word Count tool in Microsoft Word to determine the number of words to edit. The price is calculated in units of 100 words rounding down. We do not include title pages or references in the word count. The current fee is 6 EUR for 100 words. If you are eligible for a discount (for referrals, previous promotions or SFBV membership) we will include this on the quote. What do I get back? What should I do next? After many years of successful editing we have found that it is best to edit text directly then reread and check the edited version for accuracy, meaning and fluency. This means we do not use the Track Changes tool and you receive back a new Microsoft Word document that may differ substantially from the original. We use the Comment tool to highlight ambiguities or other problems in the margin. When you receive your edited manuscript, you need to read the manuscript thoroughly and check the technical accuracy. If there are any comments in the margin, you will need to take the necessary action and delete the comments. If you feel there are any problems or you need help resolving any ambiguities, just get back to us within 2 weeks. Please do not forget to format your manuscript to conform to your chosen journal’s Instructions for Authors before submitting it. I received a quote for editing. What should I do next? If you accept the quote, just reply ‘I accept the quote’ in an e-mail. Editing will start immediately. You have no obligation to reply to the quote e-mail. If you find the quote too expensive for a whole manuscript we can provide a quote to edit certain sections like the Abstract or Results. I received an invoice. How should pay? We send invoices out by post at the end of the month in which the work is completed. We send the invoice to the work address of the author or to the accounts department if this is indicated on a purchase order. There are three ways to pay – by credit card via Paypal, by interbank transfer or by cheque in pound sterling. All necessary details are provided on both the quote and the invoice. Payment is due 30 days after the invoice date. Please note that we accept cheques drawn on the London branch of the Bank of China. I need to provide a purchase order (Bon de commande). What should I do? Use the information on the quote to make out a purchase order that you can send to us by post or e-mail. Please note that this will not delay editing of your manuscript (see FAQ 8). The invoice will be made out according to the information provided on the purchase order. Our accounts department deals with payments. Can you deal with them directly? Yes. Please let us know the contact details and provide them with the quote and/or invoice. After your corrections I made a few minor changes. Please could you check them before I submit the paper? Yes. We will help you hone the paper at no extra charge. However please do this within 14 days of us returning your edited document so the paper stays fresh in our minds. We need to add some more data to a paper you edited a few months ago before it is accepted. Can you check the alterations please? We fully understand how the publication process works so we offer a free revision of an article that we have previously edited, providing that the changes do not substantially alter the manuscript structure and content. If the same science has been completely rewritten or extended, for example, to submit to a different style journal, we can offer editing at a reduced rate, so please contact us for a quote. Thanks for editing our manuscript. Unfortunately the covering letter I need to submit to the Editor is not up to the same standard. Do you edit covering letters? We regularly edit covering letters. Having edited the manuscript we know what important points to emphasise, both scientific and practical, to attract an editor’s interest. We can add the small extra cost to the final invoice.